This is plate 32 from William Hodges' book 'Select Views in India'. There are two large granite rocks along the Ganges near Sultanganj, the larger of which projects into the river and is cut off from the bank at high tide. 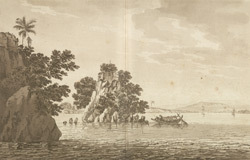 At the time of Hodges' visit, the rock projecting out of the river was "a small hermitage for a Hindoo Fakir". Hodges wrote: "this rock is always considered a place of sanctity, having upon it a small temple of the Hindoos, and on many parts of the rock an imperfect representation in sculpture of some of the Hindoo deities."